A few amago hooks with Fireline eyes. 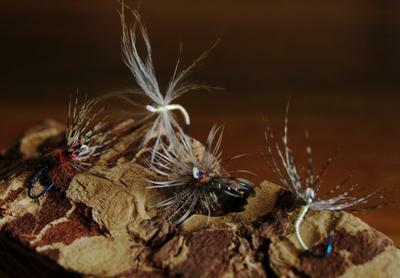 Lately, I've been tying up some flies in the Victorian style - silk, feathers, and eyeless hooks. Traditionally, the eyes on salmon flies were made of twisted silkworm gut - the silk glands of a silkworm, stretched and twisted together. It's cool material, very strong and quite stiff when dry. It's also extremely expensive, over a buck an inch. I don't mind the cost if I'm planning on framing the fly, but it's just too expensive to fish with. The search for a good alternative has lead me many different directions. Silk cord works for light flies, but it's a little bulky and the loops tend to collapse under load. Dacron backing is strong, cheap and easy to use, but it looks really synthetic and out of place. One very nice alternative is to sand, twist, then heat treat monofilament. It looks and feels a lot like natural gut, but it's a lot of work. None of the above options check all of the boxes of cheap, user friendly, good looking, and good for fishing. Enter Fireline fused Dyneema. I've been using the Crystal 30# test version for eyes on salmon flies and kebari. So far, it's been working great. Easy to use, a nice look, and very durable. For aesthetics, I'd probably go a bit lighter for kebari and a bit bigger on a large salmon hook, but the 30# is okay for either. I have been looking for a better eye material than I have been using. I will give it a try. Thanks Phillip. I dug through the stash of tackle my Dad gave me and found two new spools of Fireline fused Dyneema one in 15 pound and another in 50 pound. The 15 pound works great on the Gamakatsu "Amago" hooks and the very thin #3 and #4 eyeless hooks I bought from Chris. I have enough line for at least a thousand flies! I do like the look of the braided line for the eye. Again, thanks for the tip. I think the 50 would look great on that size hooks. I checked it out on some larger hooks that I have, and you might want to check it out as I know you are making beautiful flies!